True North, a registered non-profit company, has been actively involved in the Vrygrond and Overcome areas for the past four years, and in an ongoing bid to bring the standards of crèches in underprivileged areas up to code, has embarked on a project which seems massive, but, according to their CEO, Vicky Kumm, will be achieved through the help of their volunteers, sponsors and donors. “At present there are approximately 1 700 unregistered crèches in the Western Cape with an average of 50 children in each. The challenge that these crèches face, is that, in order to get their subsidy from the government, they have to fulfil certain regulatory requirements. This is a catch 22 situation because they do not have the funds to upgrade their facilities in order to fulfil these requirements, so must continue as they are,” said Kumm. True North works toward determining the early childhood development (ECD) needs in underprivileged communities and then works towards meeting those needs. These needs are met in a holistic way by providing for the health and safety of the children, ECD training to teachers and parents, business skills to principals and rebuilding crèches. One of the building projects it is involved with at the moment is getting the Masikhule Educare crèche up to the necessary standard and registered with government. 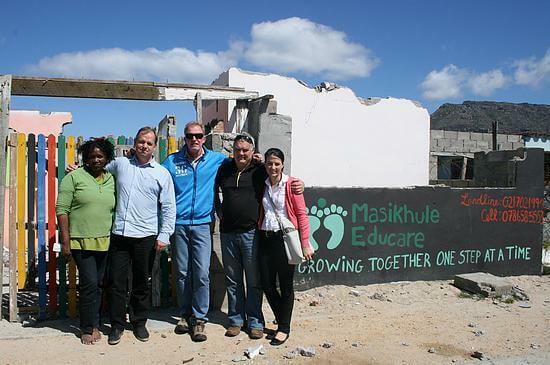 Masikhule Educare, which opened in 2009, was originally an informal home-based care centre with limited space and currently cares for 53 children between the ages of eighteen months and six years. “After considering many building options, it was decided to use a light steel frame system (from Techhomes) which has turned into a very cost effective method of building and, as a bonus, a very “green” method of building,” said project manager on the build, John van Niekerk. He explained that the steel frame construction system, together with magnesium Megapan Board cladding, is well suited to this sort of build because of the speed at which a structure can be erected, as well as the favourable overall cost. The building, including the basic finishes, will cost around R3 700 per m² excluding VAT. “The building will be fireproof, have a 30 year guarantee and be impervious to mildew and insects. The insulation is also two times better than a normal brick and mortar building, making it more energy efficient and ideal to be used for a crèche where children need a dry and warm environment. The upkeep and running costs of such a building are also significantly reduced,” said van Niekerk. “Apart from the building method and products used, the speed at which a building can be erected using this method is better than any other we know of,” said van Niekerk. “It takes approximately six weeks to demolish, throw the slab and erect the new 200m² crèche, he said. The Pearson Foundation has been one of True North’s major sponsors. With their Global Assist Challenge they have offered to match dollar for dollar, up to the value of $100 000, all donations made by businesses and individuals to True North until the end of the year. “In addition to this Pearson have donated 10 000 books and sponsored a literacy room that has been established at our offices in the Vrygrond Community Centre. The Pearson Literacy Room and Masikhule Educare will be officially launched on the 9th November and representatives of Pearson will be present to celebrate this success with us,” said Kumm. The Literacy Room will be used for training sessions, reading sessions with children and parents, and for ongoing parenting and child minder courses. RED-i (Real Estate Development Interactive), a property development software company, has been another regular True North sponsor because of their ongoing commitment to social responsibility. They have made available their industry networks and contacts, technology and financial support in order to reduce True North’s operational costs and infrastructure. They also continue to encourage other companies, especially those in the property development sector, to contribute to sustainable projects such as these that are making a tangible difference in terms of infrastructure, education and the care of children, said Kumm. All those interested in coming to the launch on the 9th November are welcome to email vicky@true-north.co.za to request details.